Ahh, the things we do for beauty. We've definitely seen our fair share of unusual beauty treatments—fish pedicures, vampire facials (we're looking at you, Kim Kardashian), and using egg mousse as body oil are only a few that come to mind. But Kate Hudson might have just introduced us to the scariest under-eye treatment we've literally ever seen. No, we're not talking about your standard sheet mask (that probs doesn't scare anyone at this point) or even a gel-like sticker you secure under your eye after a rough night. Kate's under-eye patches are a bit more, um, technical? First of all, it looks like something out of a sci-fi movie—two patches connected with a wire that ends with a beeper. 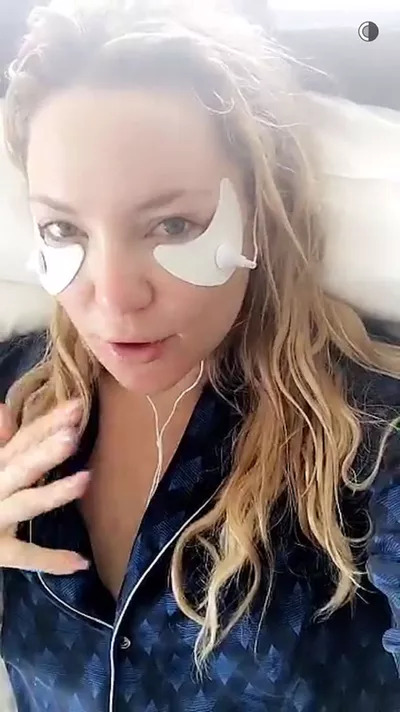 The actress took to Snapchat to document her experience with this odd beauty gadget, and even though she swears it works, Hudson also says it hurts her eyes a lot. We believe the exact words she used are: "I am in so much pain." Yikes. But then again, a bikini wax isn't a walk in the park.